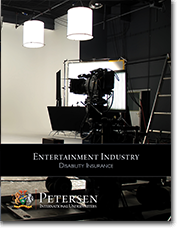 For your clients working in the entertainment industry, Petersen International Underwriters has developed the Entertainment Industry Disability Insurance Plan. Traditional insurance carriers may refuse to insure those working in the Entertainment Industry as their incomes can fluctuate between jobs. This industry is a broad one; PIU’s Entertainment Industry Disability Insurance Plan was developed to provide those who work behind the scenes with the coverage they require. Bill M, a 38 year old voice actor. Bill earns $125,000 annually doing commercial voice overs. Like most people he has to get up in the morning and report to work. This might be an audition, or an actual studio session. His income supports his family of three, a nice home and two newer automobiles. A disability would cause major financial hardships. Petersen International Underwriters offered this income earner a disability plan that would replace 65% of his income even though his occupation was that of a voice actor. This plan covers them all and allows you to prescribe adequate levels of income replacement in the event that a disability leaves them unable to work. This plan provides monthly benefits from $1,000 to $100,000 or more and offers lump sum benefits of $50,000,000 or more. Make sure all of your clients are protected from the financial ruin a disability could bring with the Entertainment Industry Disability Insurance Plan.